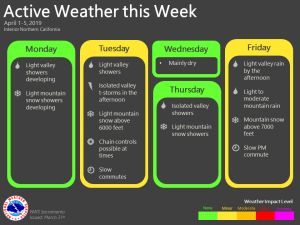 April 1, 2019 – Unsettled weather this week with the potential for another stronger system Friday and Saturday. Partly to mostly cloudy skies cover the northern half of the forecast area while skies remain mostly clear to the south. Current temperatures are considerably milder across much of the region compared to 24 hours ago and range from the upper 20s to mid 30s in the mountain valleys to the mid 40s to around 60 elsewhere. Ridge is shifting east as the closed low presently centered along 40N west of 130W edges closer to the West Coast. It will lift toward the PacNW over the next 24 hours. 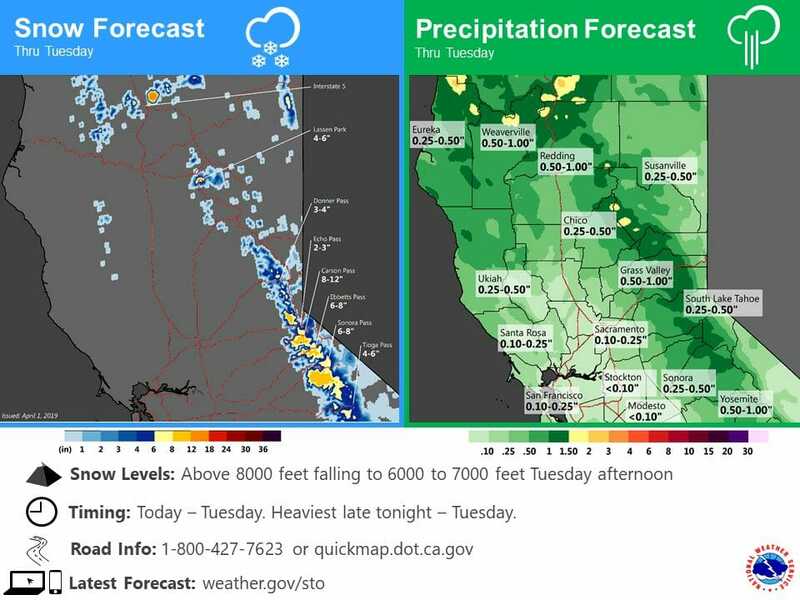 As it does, several short-waves will rotate through NorCal leading to showers and perhaps a few thunderstorms through Tuesday night. QPF over the valley is expected to range from a tenth to half an inch while amounts over the foothills and mountains will generally range from half an inch to around an inch with locally higher amounts. Some accumulating snow will be possible late tonight into Tuesday evening across the higher elevations. Wednesday will be mostly dry under short-wave ridging with a few showers limited to the northern mountains. 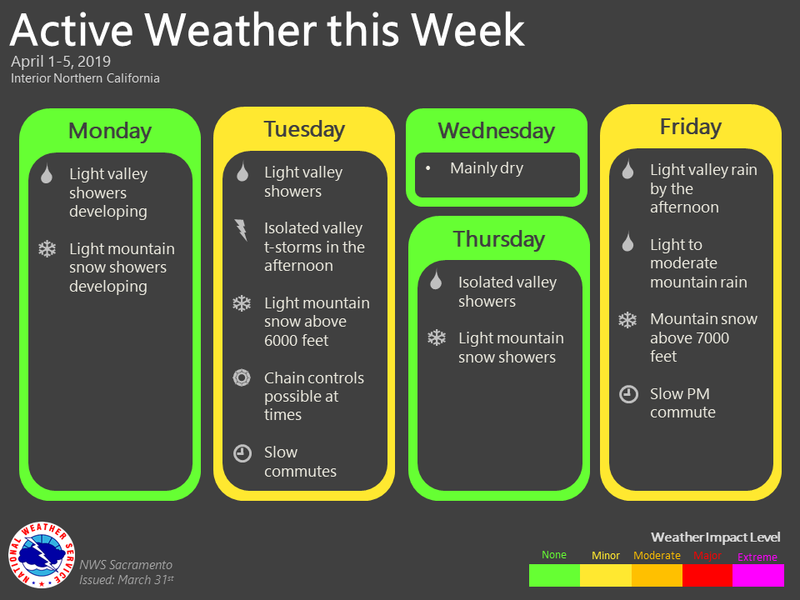 Showers will likely increase again beginning Thursday as the next system approaches. 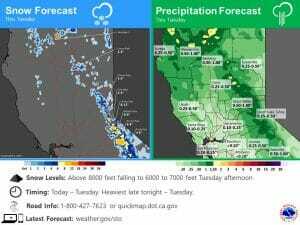 Late season AR takes aim on NorCal Friday as Pacific frontal system brings widespread moderate to heavy precipitation Friday into early Saturday. Mountain travel impacts are expected with snow levels 6000 to 7000 feet. Breezy to windy conditions also look likely with fropa. Precip turns showery by early Saturday with best chances over the foothills and mountains. AR weakens into Sunday, but continues higher PW air directed north of I-80 for continued shower threat. Heights increase into Monday lifting precip line gradually north of the CWA. High temperatures forecast below normal Friday, warming to above normal Sunday and Monday.